For Better Health, Go Mediterranean! 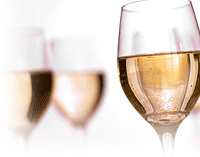 Chardonnay is the most popular white wine worldwide. Prized overall for its creamy round texture, it can also offer an enormous variety of flavors depending on where it is grown and how it is produced. Because it is grown in so many different regions, a wide variety of styles exist. Fruit flavors can include apple, pear, white peach, pineapple, and lemon. Other typical descriptors include cream, butterscotch, hazelnuts, almonds, and freshly baked or grilled bread. Chardonnay also takes well to oak aging, which can give it a nutty vanilla spiciness or toasty oak notes. White fish, oysters, mild chicken dishes, mild and creamy cheeses. Flavorful chicken and pork dishes, salmon, roast turkey. Mildly spicy Asian fare, flavorful chicken and pork dishes, grilled fish.